Renovated to Perfection! The curb appeal sets the tone for this extraordinary all brick ranch situated in sought after subd of Claymont. Backing to Ballwin Golf Course & open common ground w/ picturesque views from pleasant patio. New roof & gutters, HVAC, front windows, electrical systems, lighting & more. Gleaming hardwood flooring, new interior/exterior doors & millwork throughout this 2200+sf beauty. A smart, modern & open floor plan offers decadent dining rm accented w/ wainscoting & sophisticated living rm. Vaulted great rm w/ gas fireplace, dry bar & French doors leading to newly landscaped back yard. Dream island kitchen features granite, custom cabs w/ pull-out's, SS appl., subway tile & backsplash + brkfst bar.3 spacious BR's, including mstr suite retreat w/ 3 large closets, full bth & main floor laundry. Unfin lower level awaits your finishing touches. 2 car rear entry & freshly painted interior. 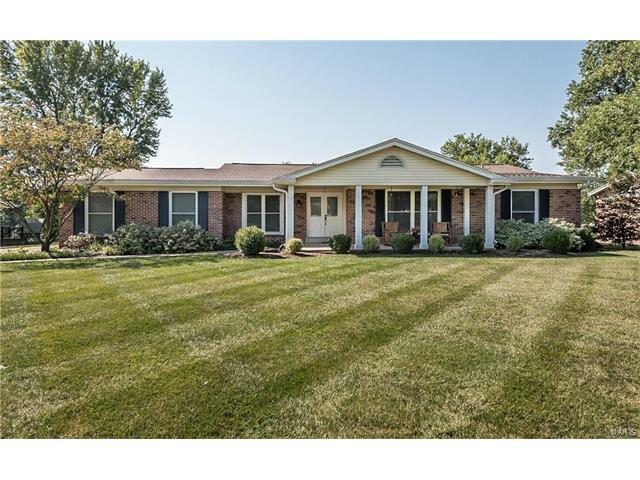 Rockwood School District.Nestled on 1/4ac+acres w/ unsurpassed value! HURRY! Clayton Road to South on Claymont to Right on Bellerive to Left on Wellshire. Home on Right.